I wish I had an overview shot to share. It’s got to be one of the most gorgeous back yards in California. Luckily for me, I got to actually see these installations in person. Which means I could actually photograph them. Connecting with our customers in order to procure inspiring photographs is always challenging:New Ravenna sells to a showroom, they usually work with a designer or architect, and then the product is sold to the home-owner. You can see that navigating this path could be cumbersome, so it is a treat when I get to lay my eyes on an installation of our work. There is a special place in heaven for showroom sales staff that email us photos of installed work! 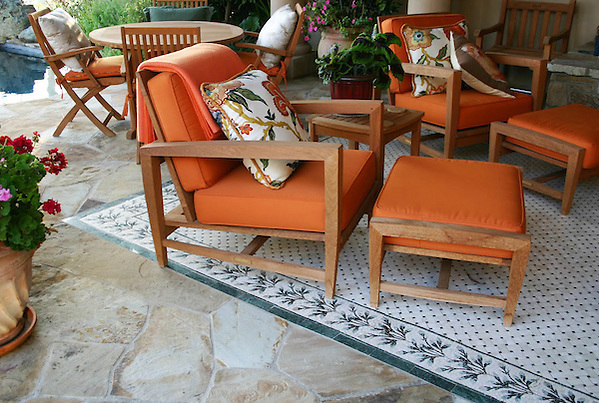 Here’s another novel application of mosaic: an inlaid water jet pattern in an island. Next, they are renovating their master bath…I’ll keep you posted! I have never seen a border cut into a kitchen island. What a wonderful idea. It really makes the backsplash more of a suite of design. And so in love with the look of the two mosaics in the pool, the modern vertical tatami at the overflow and the more traditional wave at the waterline. The texture of the marble looks great with the warmth of the stone. LLL-Love it! Love the idea of cutting the border into the island. What beautiful installation shots and inspiration!